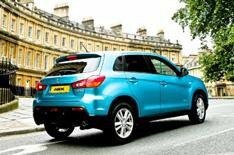 2012 Mitsubishi ASX 1.6 review | What Car? The Mitusbishi ASX has been updated for 2012 and this is our first drive of the 1.6 petrol model. The ASX is Mitsubishis rival for compact SUVs such as the Nissan Qashqai and Volkswagen Tiguan. This is the one petrol model in the range, and is available with two-wheel-drive only. The 1.6-litre engine, which is carried over from the previous model, produces 115bhp and is coupled to a five-speed manual gearbox. CO2 emissions are unchanged at 135g/km, but fuel economy has been improved from 47.1mpg to 47.9mpg. New features for 2012 include regenerative brakes and a power management system, but there are no visual tweaks. Whats the 2012 ASX 1.6 like to drive? The 1.6-litre petrol engine is surprisingly capable on most roads, although the engine doesnt have the pulling power of a diesel or turbocharged petrol. The real issue is volume from the engine in doing so- humming and buzzing echos through the cabin when accelerating in any gear, at any speed, drowning out most road and wind noise. Once up to speed, the engine quietens down and doesnt irritate. Unfortunately, wind noise picks up, primarily due to the ASXs large door mirrors. Still, the gearshift is precise and changes are smooth. The steering is light, but slow to return to centre. The handling is sharp for an SUV, but the ride is rather firm. Whats the 2012 ASX 1.6 like inside? We tested the mid-range 3 edition, which costs from 18,359. Standard equipment over the entry-level model includes climate control, keyless entry, Bluetooth and parking sensors, so its well equipped. However, the interior quality could be better. The dashboard plastics are hard to the touch, and the silver trim highlights are not enough to lift its drab ambience. The model we tested does without the touch-screen navigation system on more expensive models, and instead has a small, red LED display- resembling an early-90s clock/radio. At least the simple dashboard layout is functional and easy to use. The ASX is reasonably practical. Six-foot passengers will fit in the rear, even with the front seats pushed as far back as possible, and headroom for all five occupants is generous. The boot is flat, with a minimal lip, so bulky items can be loaded with ease. There are also two storage areas at each side. The Mitsubishi ASX 1.6 is well equipped, keenly priced and isnt bad to drive. Unfortunately, it feels outdated compared with many rivals and the interior although practical is dull. Wed recommend a Nissan Qashqai instead.